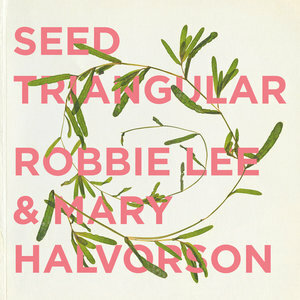 Both Robbie Lee and Mary Halvorson have done their share of experimenting. They might feel more at home when they're out wondering. Composer Lee specializes in wind instruments that most of us haven't heard of, particularly those primarily of historical interest. Halvorson's the most contemporary of contemporary jazz guitarists, a prolific performer whose own compositions look forward without ignoring tradition (Thumbscrew's releases Ours and Theirs from this year make excellent examples). For Seed Triangular, the two musicians come together for some of their most daunting work, an album driven more by a sense of playfulness and wonder than by results. Nearly every track surprises, and if the disc fails to cohere, the pleasure of hearing the two artists figure out what they're doing remains throughout. The outing especially challenges Halvorson, who allegedly learned this instruments as they went. The 1930 Gibson L-2 guitar seems like it would have been fairly comfortable; Halvorson's made her mark with Guild hollow body guitars, but the transition to the antique flat top seems smooth enough. She adjusts her playing appropriately, frequently abandoning her typical jagged approach or the chordal atmospheres for something more in line with Lee's archaic work. The 1888 banjo makes a little more of a jump, but on "Rock Flowers" she manages to turn it into a free jazz instrument, full of ambition and fearlessness. More unique, the 18-string Knutsen harp guitar makes for the oddest instrument in her array. Not only does it offer triple the strings (including a set of bass strings), but it provides strange tunings and an odd and uncomfortable-looking shape. Halvorson slides into the groove, though; apparently, if it has strings, she can play it. Lee fits his instruments more naturally, having worked with chalumeaux, early 19th-century flutes, and the like before. He takes the lead on many of the tracks, his blowing driving most of the sense of melody that develops in each of the songs, through tracks like "Spring Up There" show the musicians in earnest conversation, trading sections in response to each other. Lee seems to shape the album, with collaborator Halvorson bringing new ideas. The new ideas guide the album, but it rides on the play at the heart of it. The tracks come from edited performances, improvised pieces put seamlessly into a greater sense of coherence. Few of the songs sound as developed as we'd expect from Halvorson; the point remains these two artists bouncing ideas and phrases around and figuring out what do not only with their musical thoughts, but with the strange combinations of instruments they've come up with. That approach leads to wonderfully inventive playing and fascinating listening, but at times it sounds much more like brainstorming than it does focused improvisation. "Seven of Strong" offers a bit of a linear progression, suggesting at least a beginning and end. Other songs are lovely, like "like a ripple made by the wind" but feel more like snatches of songs rather than finished works. The brevity of some of the pieces contributes to that sense, with a third of the songs passing by in under two minutes. Despite its occasional shapelessness, Seed Triangular remains fascinating, blending odd tonalities, neo-Renaissance fare, and complex playing. Hopefully, this Lee/Halvorson collaboration isn't a one-time event. This album offers the groundwork for a deeper dive into this material. The oddity of old sounds and modern improv combine with artistic creativity to spark something. Now the musicians have a chance to properly fan it.